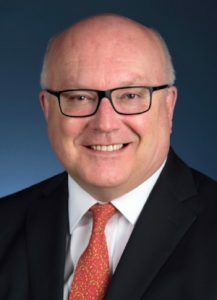 We are delighted to confirm that our host for our annual Tait Winter Prom is the newly appointed High Commissioner for Australia, His Excellency The Hon George Brandis QC. 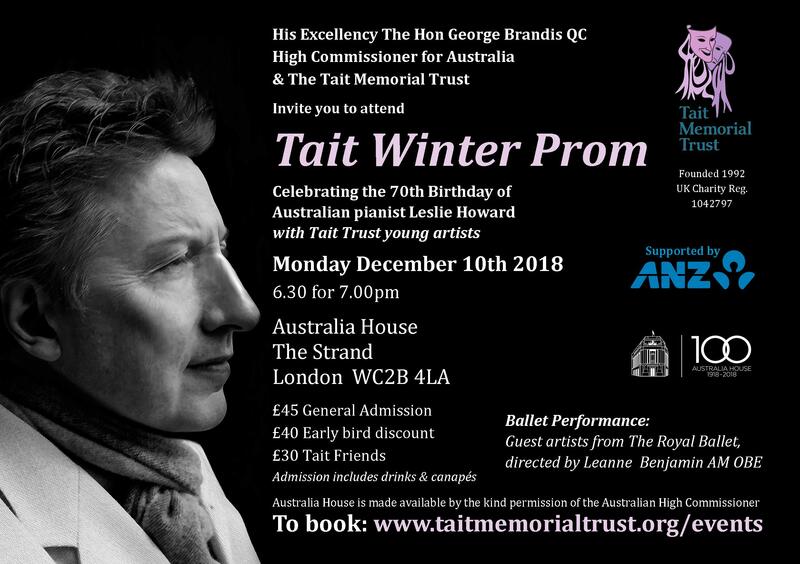 This year we celebrate the 70th birthday of our much-loved supporter and acclaimed virtuoso concert pianist, Dr Leslie Howard as we return to the Exhibition Hall at Australia House. Joined by Tait Artists we plan to tempt you with a concert featuring the music that celebrates Grand Theatre and Revolution. Leslie will be performing selections from his new CD, as well as accompanying some of our young Tait Artists instrumentalists, and we will also have a performance from our ballet scholarship awardees, choreographed by our Patron and retired prima ballerina, Leanne Benjamin AM OBE. The programme is artistically directed by Jessica Cottis (2002 ACT), now a very successful international conductor. We look forward to seeing you there. Tickets are strictly limited…book early to avoid disappointment. with performances by Tait Awardees. Join us for our 5th concert in the Salon with Ross Alley. 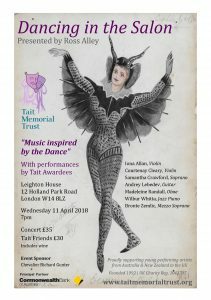 The Tait Memorial Trust has great pleasure in announcing this year’s showcase of its awardees in an evening concert on 11 April at Leighton House entitled “Dancing in the Salon”. 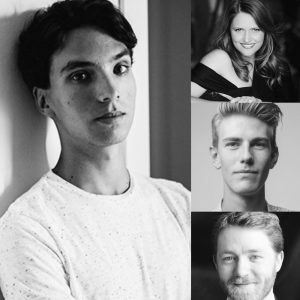 Artistically directed by Chad Vindin and presented by Ross Alley, our extremely talented young Australian performers will sweep you off your feet – literally – as they inhabit the rhythms of the dance in this year’s Salon Spectacular. Front cover: Unknown costume sketch from the 19th century. Source: Viola, Lady Tait’s JCW collection of costume designs. 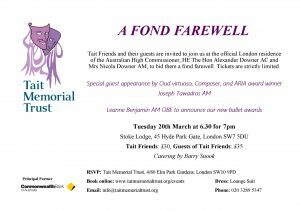 Tait Friends and their guests are invited to join us at the official London residence of the Australian High Commissioner, HE The Hon Alexander Downer AC and Mrs Nicola Downer AM, to bid them a fond farewell.